As US trade war damage is spreading, markets reflect an elusive calm before a potential storm. While Chinese prospects and reforms prevail amid challenging conditions, IMF's global outlook remains too optimistic for 2018-19. According to new data, China’s exports rose by 14.5% year-on-year in September, which is an acceleration from the previous month. However, growth in imports declined to 14.3%. Chinese retaliation is already causing red lights to blink in U.S. companies. Ford is a case in point. A month ago, the car maker bragged to President Trump it won’t make China-built car in the US. Now it faces an awakening. While Ford’s sales remain relatively good at home, the US is no longer a growth market unlike China. Yet, Ford’s sales in China tumbled 43% compared with 2017. Moreover, its wholesale shipments also fell 26% in the second quarter, thus wiping out profit from its joint ventures with Chinese automakers. So Ford had to cut its full-year guidance on increasing concerns about its businesses in China (and Europe which Trump has also targeted in the tariff wars). The robust performance of Chinese exports is likely to cool in the fourth quarter when more costly U.S. tariffs begin to bite and the momentum of the global economy will weaken; possibly more than currently expected. The fluctuations of market expectations tell the story. What we are witnessing is the elusive calm before the impending storm - if Trump’s trade wars cannot be contained. 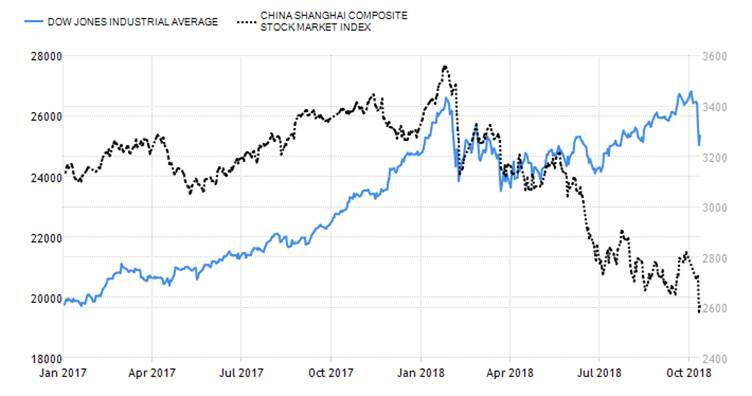 In the Chinese markets, which are dominated by volatile retail investors, have been uneasy since the first trade war signals in early year. In the US markets, which are dominated by steadier institutional investors, the negative reaction has been more recent and disruptive. But both signal the obvious: there are no winners in trade wars (Figure). Despite Trump tariffs and bilateral uncertainty with the US, China’s exports have been growing robustly all year. These are mainly short-term gains, however. Companies have been front-loading trade to get ahead of the expected tariff increases, but that will wane if the US-Sino ties continue deteriorate. Nevertheless, as concerns are mounting in the US, Trump continues to under-estimate the resilience of the Chinese economy. When the People’s Bank of China (PBOC) recently cut banks’ reserve requirements, analysts saw the cut as an affirmation of Chinese government’s commitment to support the domestic economy. In the new, more challenging status quo, monetary accommodation is likely to continue, along with further fiscal easing. In the short-term, China is responding and adjusting to US tariff wars. In 2018, growth forecast is 6.5% to 6.6%, thanks to the strong first half of the year. Moderation in the second half will reflect US tariff wars and slower demand growth. For now, solid service sector growth, supported by monetary and fiscal support, has kept the economy on track. Inflation is moderating and current account surplus could narrow more than expected. Trump tariffs will hurt export growth and thus the growth of manufacturing investment. Moreover, the White House’s sharpened tone suggests US trade hawks seek to instigate capital outflows from China. In the medium-term, China is deleveraging, while reducing poverty and pollution, to sustain higher-quality growth. A year ago, shadow banking still peaked at more than 15% year-on-year; now its growth has plunged. While substandard loans and actual bank losses have been relatively low, “special mention” loans - a category slightly above nonperforming loans - remain substantial, though they have been declining. Trump’s trade offensives complicate and defer Chinese reforms, but the direction of these reforms prevails. Ironically, over time US tariffs will accelerate China’s long-term rebalancing. This will be challenging in the near-term, but could make Chinese economy more resilient in the long-term. The International Monetary Fund (IMF) has now cut its forecast on global economic growth to 3.7% percent for 2018-19, citing rising trade protection. But that is still too optimistic. It downplays the full impact of the effective US tariffs, the retaliations impact, the inclusion of new potential tariff targets and subsequent collateral damage. What is needed is a united front of advanced, emerging and developing economies for global trade. Otherwise, the alternative will be the kind of global depression that was barely avoided in 2008.